Jowdy Davey – Director of the Lowender Peran Festival, bard of Gorsedh Kernow, Secretary of the Cornish Dance Society, musician for the North Cornwall Ceili Band and Tan ha Dowr Cornish dance youth group, performer in Kemysk and the Bolingey Troyl Band Cornish dance groups…. and as my day job, I’m Head of Fundraising at Hall for Cornwall! 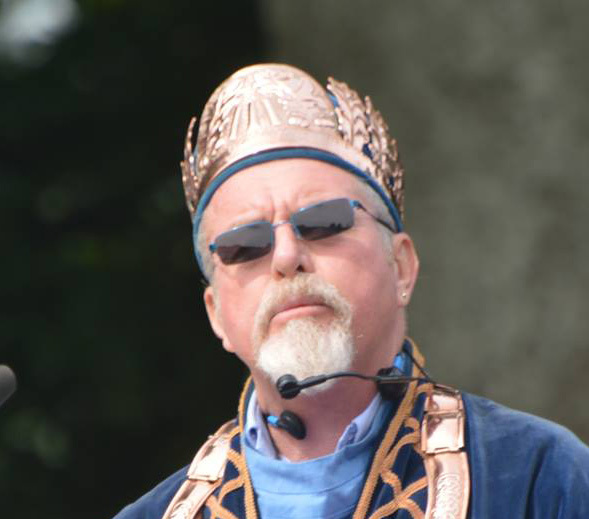 Merv Davey – Director of Lowender Peran Festival, Grand Bard of Gorsedh Kernow, musician in North Cornwall Ceili Band and itinerant Bagpiper. Jowdy – I’ve been lucky enough to promote Cornish dance and music locally and internationally with my involvement in various cultural groups. As a child I grew up performing with ‘Cam Kernewek’, the first community dance team to display traditional dance collected from Cornwall. Since joining the Lowender Peran committee nearly 10 years ago I’ve managed projects including a major tribute concert to celebrated Cornish singer Brenda Wootton, a collaboration between community choirs and Cornish dance teams with over 200 performers and a ‘Silent Ceilidh/Troyl’ with chart hits set alongside traditional music on wireless headphones. I founded both Tan ha Dowr Cornish youth dance team in 1997 and Kemysk Cornish Dancers in 2010. As a language bard of the Cornish Gorsedh I’m also a champion of Kernewek, the Cornish language, which among other things saw me take the stage as bilingual compere for the Celtic Media Festival in St Ives in 2014. It’s safe to say the majority of my ‘spare’ time is taken up with Cornish cultural activities! Merv – I can trace a thread of family involvement with Cornish folk music and dance tradition that goes back 140 years. My great grandmother played for folk dancing on the fish cellars in Newquay in the 1880s! Banjos and mandolins form part of my earliest memories and it was probably inevitable that I would get drawn into the world of Cornish folk tradition. My grandfather was also an enthusiastic member of the Old Cornwall Society and encouraged a family interest in the Cornish language and its presence in dialect and the landscape. For me the two threads of folk tradition and Cornish language came together with the formation of a group called Kemysk in 1978. 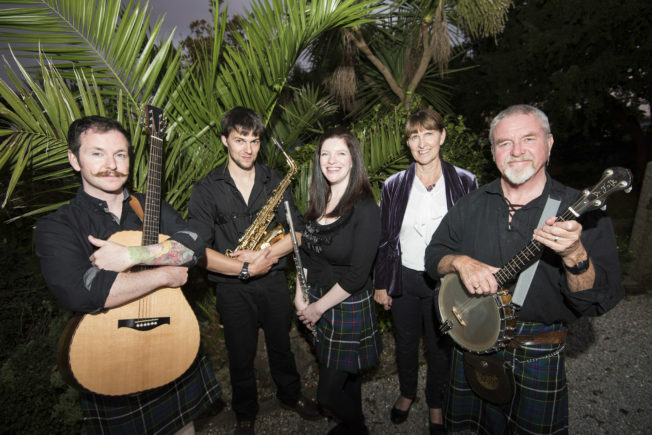 We took an opportunity to enter the Pan Celtic traditional singing competitions in Killarney of that year and were the first Cornish group to win any of the Pan Celtic competitions. 1978 was a busy year. I passed my Cornish language examinations and was invited to become a Bard of the Cornish Gorsedh. It was also the year that Alison and I married and her interest and expertise in folk dancing added yet another element to Cornish folk activities. 1978 also saw the first Lowender Peran Celtic festival but it was Alison rather than me that helped to organise this as I was working away at the time! Today Cornwall’s distinct culture and heritage is formally acknowledged by the UK Government through recognition of our national minority status. In the 80s and 90s, however, we were dominated by what can only be described as English cultural imperialism. The notion of a Cornish language and a distinct traditional culture was ridiculed. We used Lowender Peran as a platform to promote Cornish culture and a springboard for a series of research projects. I researched and edited “Hengan” a book of traditional Cornish songs and dance tunes and followed this up with a series of papers, publications, CDs and videos promoting Cornish music and dance traditions. Ably assisted now by a second generation the 21st century proved a very different world with formal recognition of our language and culture and even some funding! Lowender Peran launched the “An Daras Cornish Folk Arts Project” taking advantage of digital media and the internet to provide easily accessible information and resources. This had an immediate impact on the Cornish Diaspora with Cornish music and dance groups springing up worldwide, especially in Australia. The website continues to have thousands of hits per month and we have a constant stream of enquiries. Our most recent collaboration has been with a Brazillian outfit called Grupo Arallec’h who have embraced Cornish Scoot dances as part of their displays. I was fortunate in having the opportunity to join Exeter University’s Institute of Cornish Studies to undertake post graduate research into Cornish folk tradition. This research led to the award of a doctorate and further opportunities to promote Cornish culture and Heritage. The latest is a collaboration between Lowender Peran, the Institute of Cornish Studies and Cornwall Council’s Kresen Kernow to set up a Cornish music archive. But the most novel project was to act as consultant for the first Poldark series and to appear as piper for the two village weddings. My personal journey in promoting Cornwall’s heritage and culture took a different direction when I was elected, first as Deputy and then as Grand Bard of Gorsedh Kernow. This led to an entirely new set of experiences from having lunch with the Queen to a head on collision with the UK government when introduced proposals to do away with Cornwall’s 1200 year old border with England! Readers will be reassured to know this is no longer on the agenda. Being Grand Bard has not taken me away from involvement with Cornish music and dance. Far from it, the invitation to lead the Bardic Ceremony for Kernewek Lowender held in South Australia’s “Little Cornwall” came with a series of bagpipes gigs and an invitation for Alison and I to join the Mayor in leading the Furry dance through Kadina! What more can I say but Kernow Bys Vykken. Jowdy – Being one of the festival case studies – as a busy committee of volunteers it’s given us a rare and important opportunity to sit back and reflect. Merv – Lowender Peran is organised by a small and very busy group of people. Cornwall 365 encouraged us to take time out and reflect on our success with the festival and the reasons for this. Jowdy – During a performance at the Minack I saw a basking shark and a pod of Dolphins swimming out at sea – a backdrop to the show which ended up being the main event! Merv – Just occasionally I dig out my vintage Porthcawl waveski and with a bit of luck catch that three foot glassy wave to drop out of heaven. 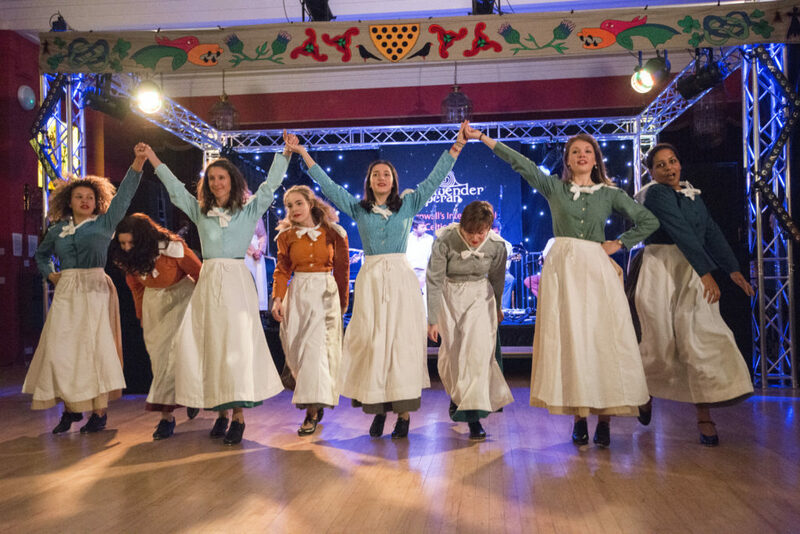 By the time I get home to tell the tale of course that wave is nearer six to eight feet…..
Jowdy – When the sun is shining, I love nothing more than a day out dancing with Kemysk Cornish Dancers. They’re a fantastic group of people I’m lucky enough to call friends and family. You feel like you’ve really earned your pint when you’ve danced all day! And it’s taken me to some brilliant local festivals and stunning locations in Cornwall I probably wouldn’t have been to otherwise. As for the evenings, I’ve seen some of the best sunsets of my life looking out over Perranporth beach from The Watering Hole. Merv – Kayaking the upper reaches of the Camel. Jowdy – If I had a time machine I’d take Arthur Biddick to see the Nuit InterCeltique performance at the Festival InterCeltique in Lorient when Cornwall was the country of honour in 2015. The Nuit Interceltique is Brittany’s answer to the Edinburgh Tattoo, staged in a football stadium. With an audience of 5,000 in the venue and millions watching on French national TV, it’s one of the most exciting and challenging pieces of dance choreography I’ve ever worked on. Arthur was a key figure in the revival of Cornish dance and proved a mine of information for step dances from North Cornwall, which he was still performing at the Napoleon Inn in Boscastle when they were collected. I’d love Arthur to have seen his dances take centre stage in front of this huge international audience. Though he’d probably have disapproved, the dancers never danced fast enough for his liking! Merv – I would take my Grandfather to the Keskan Lowender Bristol Hotel on 5th November. He was engaged in the Cornish revival 80 years ago and would be tickled pink to hear the audience joining in with songs in the Cornish language and waving flags last night of the proms style. Jowdy – There have been a few, but in my top 5 is watching 200 people, including local surfers making their way out of the sea, dancing on the sand for Lowender Peran’s beach ceili! Merv – The keep at Pendennis Castle. We perform there every Christmas for “Nadelik” with dances for all to join including the traditional Cornish “Carole”. Merv – Truro Cathedral, it was just designed for the sound of bagpipes! I have done some rather nerve wracking solo’s in front of a full house full but the most poignant was the combination of my bagpipes with Elaiz Lohro Pasco on Breton Bombarde and Roger Pinsent on the cathedral’s organ. Jowdy – By the sea – the Penwith coast, especially the bit between Botallack and Land’s End. Inland – Golitha Falls, I feel like I’m on the set of Lord of the Rings! 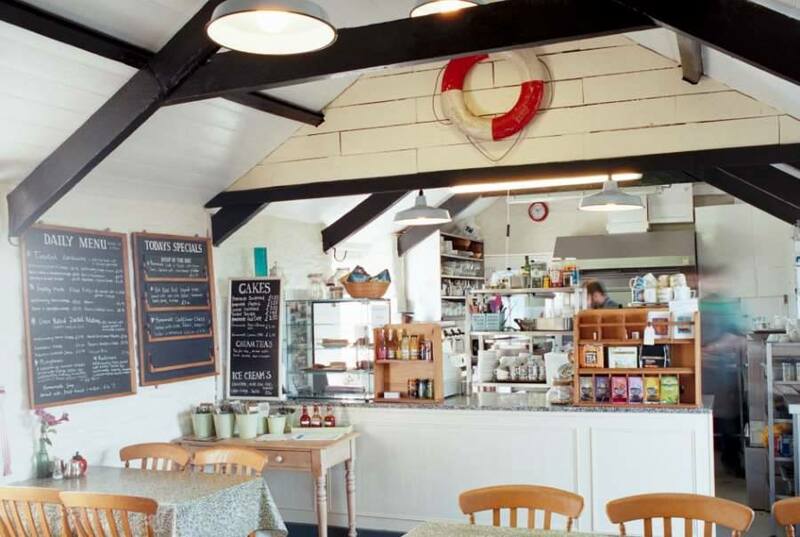 Jowdy – I love the Carnewas Tea Rooms at Bedruthan Steps. It has a lovely walled garden looking out over Park Head, and they serve the best cream tea in Cornwall (in my humble opinion). Carnewas Tea Rooms, where Jowdy says they serve the best cream tea in Cornwall! Jowdy – I’ve been lost driving across Bodmin Moor, deliberately and accidently, on various occasions. It feels like a different universe up there; I love stumbling across wild ponies and even highland cows roaming free(ish – there are plenty of cattle grids)! Merv – The journey of the Raggadazio as they take their mock court and the trial of the beast around the hostelries of Bodmin and quality test the beer on the first Saturday in July. Jowdy – If you time it right, watching the sea spray out of the blow holes on Cornwall’s cliff tops is amazing. We used to visit the blowhole at Trevone when I was little. But keep a safe distance! I also love taking my binoculars down to Godrevy and watching the seal colony. Merv – The faces on the radjels as you walk down through Golitha Falls. Radjel is the Cornish for a boulder and if you look carefully you will see that they all have faces. Cornwall’s answer to Middle Earth’s Rock Trolls! Jowdy – My other half is Breton, so Brittany is my second home. I also have a soft spot for London, especially Camden, where I spent my 20s. Merv – Brittany – festou noz, bagpipes and Breton cider – yes definately Brittany!